Churchill Brothers suffered a massive blow to their title hopes with a loss to Shillong Lajong in the I-League match held at Shillong. 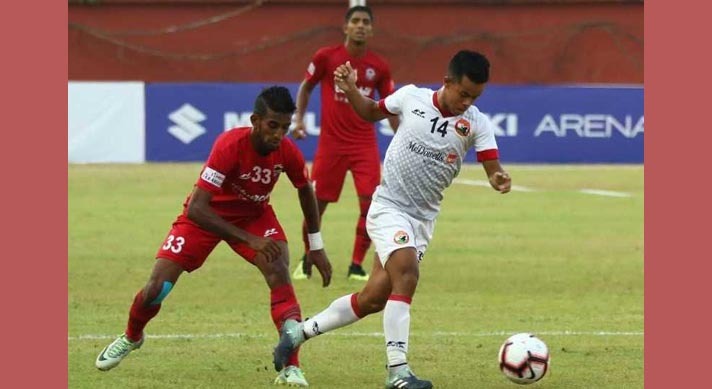 A brace (36′ and 45′) from Samuel Kynshi had put the Shillong Lajong ahead before Willis Plaza and (53′) and Anthony Wolfe (71′) levelled the match for Churchill Brothers. However, a late goal by Mahesh Singh (83′) broke the hearts of the visitors as the hosts swept home all three points, reports GOAL. As per the match report, Rakesh was seen making his comeback from injury for Shillong Lajong with Kynsailang Khongsit giving way while Mahesh replaced Lalawmpuia Hnamte. The Goans were lined up with just three foreigners in the match. Khalid and Nallappan did not make the trip to Shillong while Anthony started on the bench. It has been reported that Cavin was handed his first start of the season with Jovel and Nicholas also brought in for the tie. Kitboklang, Phrangki and Mahesh were in attacking mode which caused all sorts of problems to the Churchill backline in the opening exchanges and forced goalkeeper James Kithan to save an attempt from Pradhan from a corner. Mahesh Singh was in a very good position after being found in the box by Pale but an untimely slip caused him to lose the ball to Hussein Eldor. It was in 18th minute when the visitors opened their chart but Nichoas’ cross from the left was disappointing and was intercepted by Phurba before it could make its way to Plaza. Lajong continued their attacking spree which led Churchill coach Petr Gigiu to make his first change as he sacrificed Chesterpoul to bring in Anthony Wolfe. The hosts made their opening in the 36th minute when Mahesh made a quick turn towards goal and sets up Kynshi who slotted the ball past Kithan from inside the box. Minutes before half-time, Alison’s side had a two-goal lead going into the break as Kynshi converted from the spot after Rowilson was found guilty for a push in the back of Buam. Minutes after the start of the second session of the match, Plaza stepped up to tap in a Nicholas cross from the left to make it 2-1 (53rd minute). After that, the hosts could have regained their two-goal lead off a through ball by Samuel as Mahesh Singh helped the ball past Kithan towards the left side, but the latter’s attempt from an acute angle didn’t have enough curl on it. Then, out of the blue, Wolfe outjumped Kenstar to nod in Eldor’s long lob to make it 2-2 (70th minute). However, Mahesh Singh took a pass from Lalmuanpuia and struck from the edge of the box put Lajong Shillong back in front in the 83rd minute of the play.